Friends, the time has come. We laughed. We cried. (Okay, mostly we cried.) We shared great stories and strong feelings. We ate lunch with our kids and lived to tell engaging stories about the terrific lunch ladies (and cook managers) in our schools; our country's restrictions, policies, and prices; and how much ranch dressing you can put on a piece of pizza. We discussed Jamie Oliver's Food Revolution. We shared our own school lunch stories, wondering if it was a privilege or a pain to pack our kids' lunches. You know the expression "we eat our own dog food"? I ate with my boy too - the picture I took is above. I admit it - I tried the strawberry milk. I won't be making that mistake again. Before announcing the winners, I want to be sure we don't miss the point of this whole thing. Our goal is not to attack lunch ladies, reality TV shows, government officials, or industrial farms. Many amazing things are happening right now in this country - and around the world - related to good food, and we are energized to be in the thick of it. We celebrate the tireless folks at IATP for their food policy and program work; Chef Ann Cooper for what she's done in Boulder and around the country; Jamie Oliver for his work in Huntington, West Virginia and what it shows us all; the Lunchbox for providing health tools to help schools; the woman who secretly eats school lunch every day and chronicles it for Fed Up With School Lunch; Michelle Obama for taking on the subject of childhood obesity; School Food Focus for helping procure good food in schools; Greg Reynolds at Riverbend Farm for growing and providing organic vegetables to the kids in Hopkins; and the literally thousands of others who are doing amazing, inspiring work for our country and our kids. We applaud each and every one of you - we are thankful for your work, your commitment, and your passion. We are all the better for it. 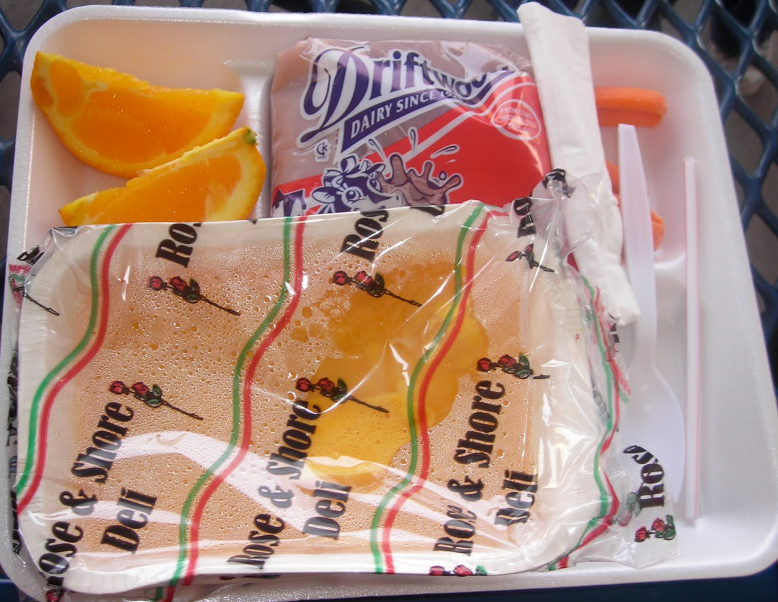 We believe that school lunch change is possible, but only if we really want it. And if we don't want it badly enough to experience the issue first-hand, it's not going to happen. It's much harder to understand the reality of what kids are eating for school lunch if we don't eat it too. We believe more people should connect with their kids at school in general. Not everyone agrees that school lunch is a problem, and seeing these school lunch pictures helps us understand the reality of the situation. We owe it to our children to make thoughtful decisions, to be mindful of what we feed them, to teach them good eating habits, and to share their experiences. The health of our families and our country depends on it. Grand Prize: a year of free organic milk from our partners at Organic Valley and one Easy Lunchbox System. Being at school lunch today brought back a memory from my own school days of Brad Benner following me around the playground asking me if I liked soggy hamburger buns. I could see he was holding something under his shirt, so it was with caution that I asked, "Why are you asking?" "Just answer the question," he insisted. "No, I don't like them." I said, still wary. Out from under his shirt came a petition and a pen. "Sign your name here if you don't like soggy hamburger buns." I signed. And you know what? We still had hamburgers at school, but they changed those soggy buns. Instead of heating the burger and bun together, which did make a soggy bun on the bottom, they heated them separately. It was a simple solution, and the most amazing thing of all is that the change was brought on by an elementary school student. 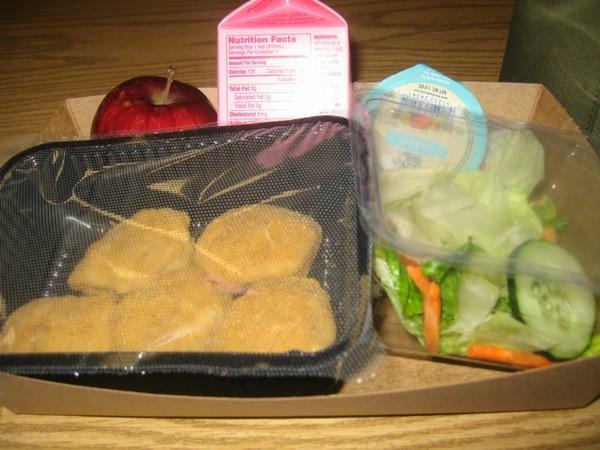 Maybe we need to start another petition for healthier school lunches. Until there are significant changes, my daughter will continue to bring her lunch. But what about all the kids who have parents who don't think they have time to bring a lunch, get school lunch paid for, or just don't care? It's for those kids, that are eating this food every day, that something needs to change. I’m not going to lie, it did taste like a Salisbury steak. I only had a slight initial cramping when I started to eat it. Keep in mind, however, I was still convalescing from the “Great Enchilada Assault of 2010″ just two days prior. I have always assumed today’s version of Salisbury steak, was just that, steak (ie. beef) with seasonings. Of course, me being me, upon looking at the school version, I began wondering how they managed to get the thing so flat ... and un-beefy. Third place: One Easy Lunchbox System and one lunchbox from Linden Hills Co-op. The "fruit" was mushy peaches in syrup, again in individual containers. The amount of trash generated from all of the single serving containers makes me sad. There was a baked hash-brown triangle as well. The kids happily squirted ketchup all over the eggs and potatoes and ate away. I had a harder time getting the stomach for it, not being in the habit. Fourth place: A DVD of the film King Corn. I no longer have to be concerned that my son is consuming high fructose corn syrup or artificial colors/flavors and am rest assured he is eating fresh vegetables from the salad bar, along with BGH free milk and daily vegetarian options. We are blessed to have a proactive and educated Nutritionist looking over the well being of our children. That's all, folks. We hope you learned as much as we did from this school lunch challenge and that you had fun in the process. We're just getting started, and we hope you are too. Lee Zukor is the founder of Simple, Good, and Tasty. Email him at lee@simplegoodandtasty.com.